Cynthia Nwaubani is a Vice President and Relationship Manager for the Wells Fargo Regional Middle- Market Banking office in North Dallas, Texas. She is responsible for developing and managing relationships with middle market companies with revenues over $20 million in the North Dallas area. As one of the nation's top lenders to middle market companies, Wells Fargo Commercial bank provides a comprehensive platform of financial products and services including loans, cash management, global banking, and investment banking services. 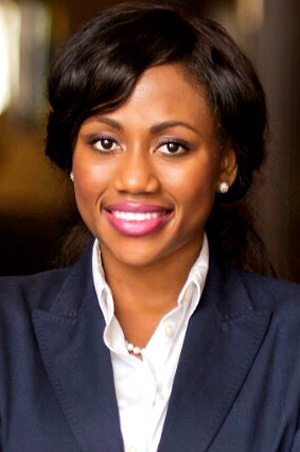 Cynthia earned her bachelor's degree in accounting from the University of Nigeria in Nigeria; and her M.B.A. in corporate finance and accounting from the Southern Methodist University's Cox School of Business in Dallas, Texas. She is also a Certified Public Accountant (CPA) licensed in the state of Texas, and has completed course works in Advanced Credit and Risk Management as part of the bank's Commercial Banking MBA Relationship Management program. Active in her community, Cynthia is involved with the 4word women's group, an organization centered on developing women leaders who work, love and pray, and she also mentors women business owners from countries that have been affected by war or genocide through the Institute for Economic Empowerment of Women (IEEW). Cynthia also serves on the International Business Council of the Frisco Chamber of Commerce and chairs the annual Global Diversity Summit and the Dallas Women's Conference for the National Diversity Council. Within Wells Fargo, Cynthia serves on the leadership board of both the Black/African American Connection and the My Generation Team Member Networks. For her service to the community, the Dallas Women's Foundation, the largest regional fund in the world, honored Cynthia with the 2017 Young Leader Award. Married with three daughters, Cynthia and her family reside in McKinney, Texas.